The Daily Cookie on Field and Feast! So cute! 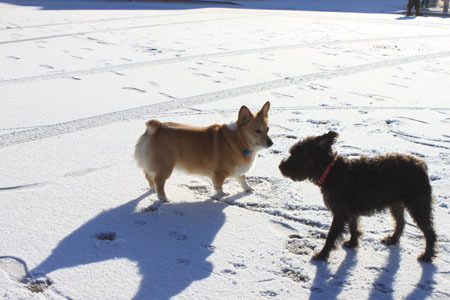 Hope you and Fuzz had a great snow day! Gorgeous post Anna – I love it. Love your little Lizzie. 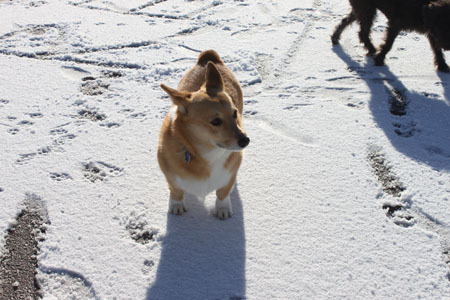 We own a corgi as well “Maddie.” She is the best pet we have ever had. 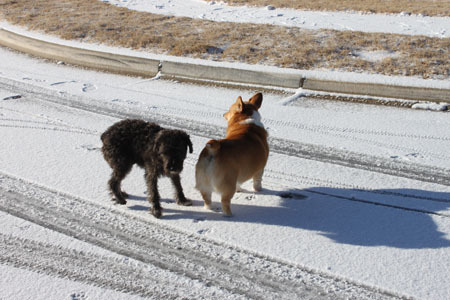 I hope Fuzz and Lizzie had a big time in the snow! 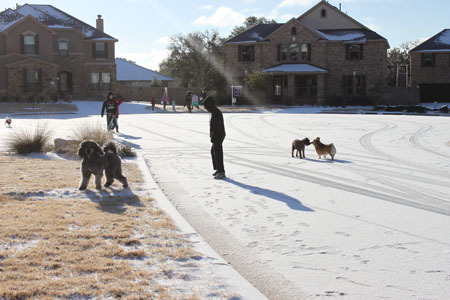 We had family members living in Dallas for almost 15 years and snow there was a big deal for them too. Needless to say it’s a season long event here…. sigh…. Shannon, I have a feeling a lot of people up north are laughing. They shut down the city for our snow! We just don’t have the resources to control it, I guess. Doesn’t happen enough. Also, the houses are my neighbors. Mine’s actually behind me when I’m taking the picture. By the way, I live in Ontario, Canada and if you pictures weren’t so lovely, I would probably laugh at you for calling that “snow”!! Lovely photos! Your house (and daughter!!) are gorgeous! 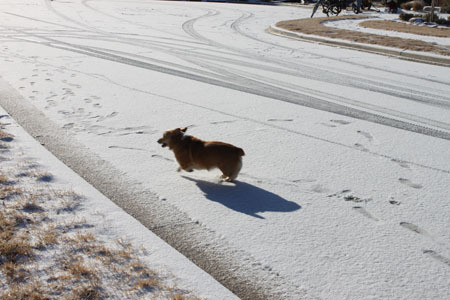 Velcro loves the snow but hates the cold. We have had snow on the ground since early December. I can take the snow but, like Velcro, not the cold. At least we have a snow plow. HA! 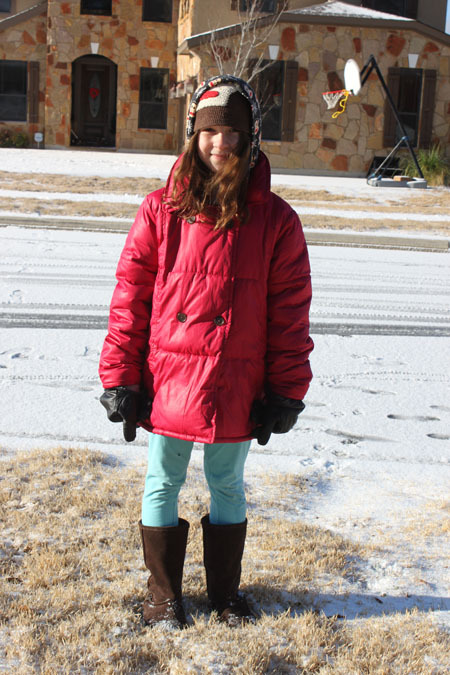 Snow in Austin?! That’s global warming for you…all sorts of craziness. You should send Fuzz up for a visit and I’ll take her sledding in Central Park. That is TOO funny to see all the dogs out enjoying the snow! Fun stuff! Those pictures are great. I live in Los Angeles and have never woken up to a snowy morning! Looks like fun for everybody (especially the dogs). How fun! Our Cody is still coming to terms that our snow is higher than he is! I should get some pictures up, it’s unreal – kind of like you getting snow at all! YOu need to visit Michigan! We got the 2 day blizzard & about 10 inches of snow. My 15 yo old terrier took one step outside & said forget it. I then got the bark that means “do something NOW!!! I gotta go & I don’t like this”. Most of it has already melted. Great photos! I am so thankful we don’t introduce our selves to each other the way dogs do. Your photos just made me chuckle. 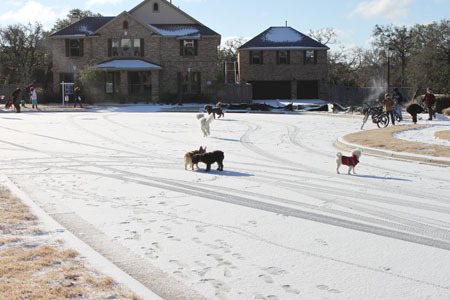 I bet snow in Austin is the coolest thing! I wonder what your munchkins would have thought of the 2 ft we got a few days ago.